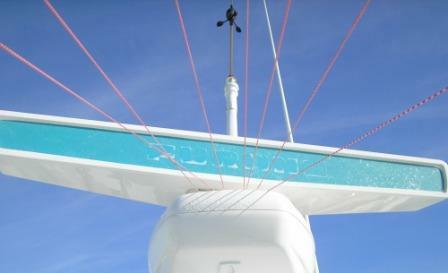 Bird droppings and seagull poo can make our lives miserable and our boats look awful! Anyway, we're stuck with the cleaning-up afterwards and that's no laugh! When the dropping is still fresh, you can wipe it off very easily with some water and soap. In the summer, the problem is less, because you're using your boat and other people are walking around too. So, the place isn't as calm for the birds to come and sit on your boat. Lot of yacht marinas have a sound system with the sound of their natural predator. This scares them away. In case you got hit, the product I recommend is the Starbrite Bird and Spider Stain Remover. In the winter time, when the yacht marina gets really quiet and only a handful of people are strolling around, do as I do and your boat is bird droppings free! Well, at least for 95%... even among birds you have party-poopers! 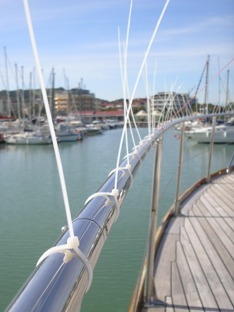 1) First, you attach cable ties on your railing. 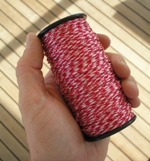 Cover the whole bow section, don't leave more than 10 to 12 cm (4 inches) between them. If you do, they'll just sit between them! 2) Second, buy some thin line, like the one they use in construction to build a wall, and tie it from a central point of the boat, towards different parts of the bow section. This annoys them and prevents them flying towards your deck. 3) Third, place a fake scarecrow on your boat. This will scare them off!